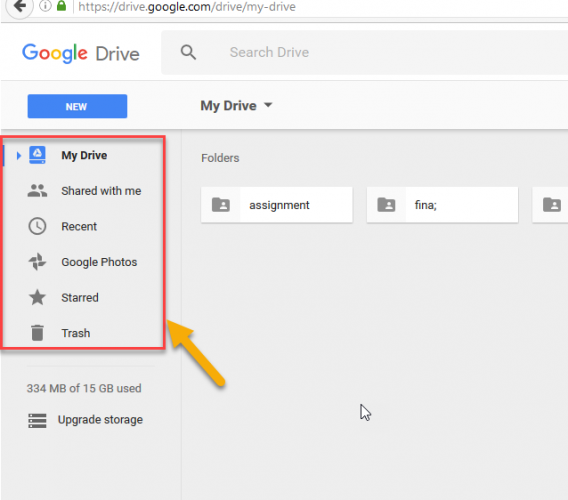 Google drive is used for storing your files, pictures, and all other important stuff. 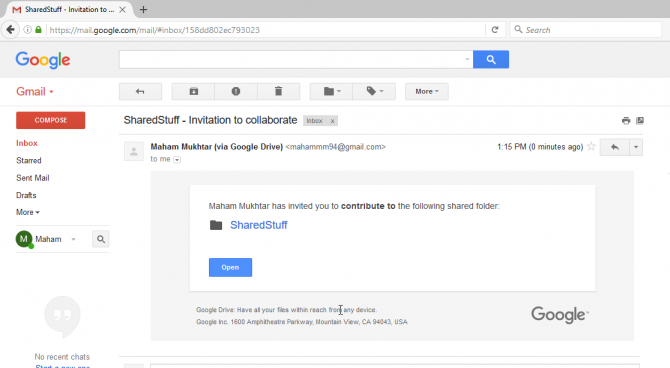 it’s one of the cool feature is that you can share your files even with those users who don’t have google account. It is not wrong at all to say that “Google is starting platform for free online office productivity”. It provides you the storage of 15 GB free. But if you are looking for unlimited storage, you can available Google’s unlimited account option which is just $10/user/month. You can go to drive.google.com to open your drive through browser. And then enter email and password to access your drive. This is the basic interface of your drive which has option of my drive, shared with me, recent and all you can see in this above snapshot. In “my drive”, you can have your uploaded folders and files and your documents. In “folder shared by me”, there is those files which you can see and can have access .these are shared to you by any of your contacts or any friends. 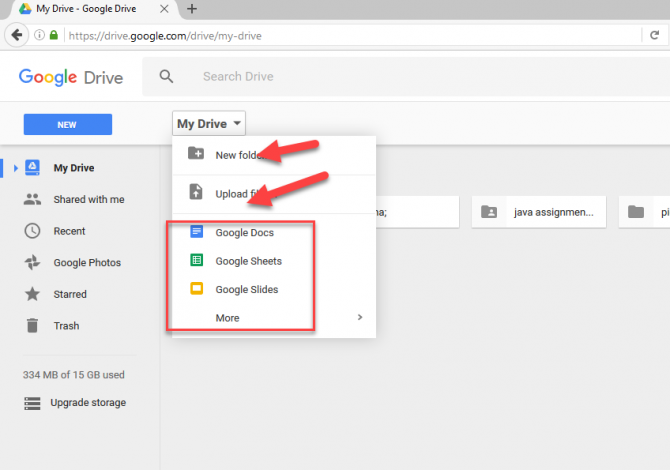 You can make new folders by clicking on “my drive” –> new folder or upload any files by clicking on “my drive” –> “upload files”. Or can open any MS office program. If you want to download any folder from your drive, just click on the folder and then on right top you see 3 dots sign, click on that, list will appear. On last of list you see download option. Click the “download” for downloading that particular folder. 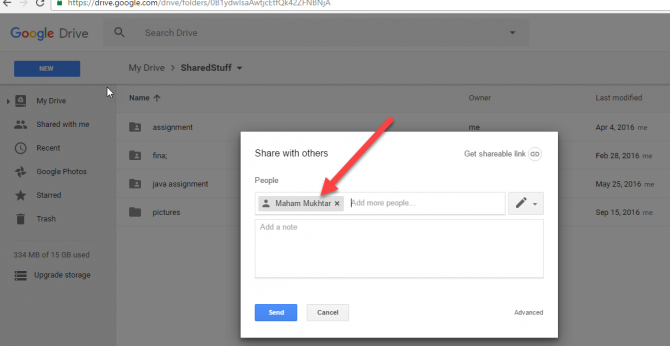 This is very easy way to get started and have access of your files and folders through google drive. 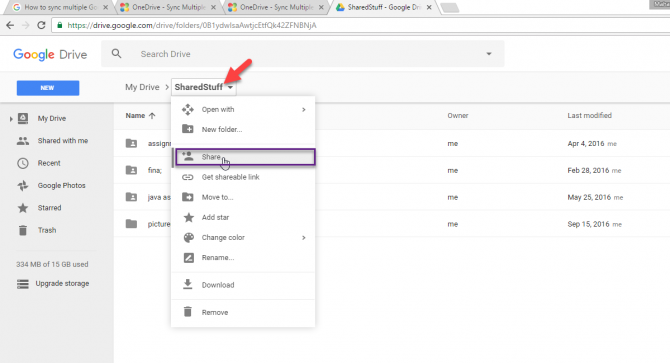 Now you can sync multiple google drive accounts in parallel and can enjoy to open your all google accounts at the same time. Just follow the below easy steps to have access of your multiple accounts parallel. Just go to “my drive” and create new folder and named it whatever you want. Click on create it. It’ll create. Then select the folders you want to move in new folder and then click on “move to”, there you’ll be asked where to move. Now open that folder and on top bar, there you’ll see the name of folder “sharedStuff”, click on it. You see the option share with, click on it. It will ask you email id you want to share it with. Just enter your another google account so that you may access that files from your other account. Now when you click on “send”, an invitation will be send via email to your other/secondary account that this person has shared some folder to you. Click on “open” to see the folder in your drive. When you open it you’ll see the contents in that folder. You can add that folders to your drive. So whenever you need them, they’ll be available for you in your drive and no loss of data will occur. So by doing all these steps, you can easily access to all of your accounts and contents in them anywhere. This is very interesting and usable feature to use your drive to sync multiple accounts. In any case if you can’t get access to your one account, you’ll have no worry because all of your important data is already synced to your other drive. 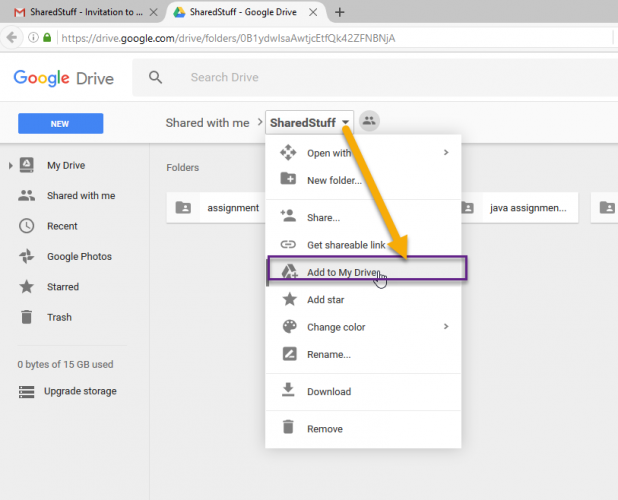 I hope this detailed discussion will provide you complete understanding of syncing your google drives to one another. I have followed your suggestion. It was very useful for me. Backup and Sync (the Google Drive app on Windows) has an option for adding multiple accounts. Just click on settings in the app, and select “Add another account”. You can have multiple accounts syncing to different folders on your device. Akshay, thank you very much! Sorry for the intrusive ads but this advertisement is important for us to keep this site up and working :). hard to read your web page your social media icons get in the way. Very annoying, thought you should know. Hi Carey, thanks a lot for your feedback. I am forwarding your complaint to our dev department. Hopefully it will be rectified soon. After syncing the new folder to the 2nd drive. Select everything ‘all’ from that 2nd drive, unselect the new folder, and drag everything selected into the new folder. Now everything is in the same folder and is accessible without duplication, and with synchronization. it appears that the data did not change from account to account. The ‘owner’ of the document holds the data storage. There is just one extra step with accessing the folder from either account, to find or add content, you must first select the new folder. Totally worth it! I have been struggling with this for years. Thank you! It can be done! Just go to the drive client in system tray and click. In the pop up window click the “:” icon (with three points vertically) and select “add a new account”. That’s all. Drive client will guide you through the process once more. Yes but by sharing another google drive in your main one do you not lose space on your main drive? This is not synching multiple Google Drives. Sorry but you missed the point. It is very cumbersome and bandwidth quota consuming method for duplicating data sets with no synchronization control. sharing stuff in your drive and syncing multiples account IS NOT the same thing. If you need to compartmentalize and need all of the space google gives you this is not a solution. I’ve been looking for this solution all afternoon, you RULE.